DOwningtown East grad Kyle Lauletta (17), walks off the field with his fellow New York Giants quarterbacks, Alex Tanney (3), Davis Webb (5) and Eli Manning (10). Kyle Lauletta admits it was a little surreal at first. The 2013 Downingtown East High graduate and former University of Richmond star grew up an Eagles fan, but now he was sitting in a room a few feet away from someone he was watching as a kid win Super Bowls for his favorite team's division rival — New York Giants quarterback Eli Manning. It didn’t take long for it to dawn on Lauletta that he belonged there. Lauletta, the gifted 6-foot-3, 220-pound quarterback who was drafted in the fourth round by the Giants, is in the National Football League. He realizes he’s in an accelerated incubation stage, which in the NFL means within the blink of an eye, he could possibly one day be the Giants’ next starting quarterback when Manning, a potential Hall of Famer, decides to retire. Manning, 37, is coming off his worst season as a pro, going 3-12 as a starter with 19 touchdown passes against 13 interceptions. The Giants were also decimated by injuries in 2017, going 3-13 overall, after coming off an 11-5 season in 2016. The Giants may be closer to the team that went 11-5 than the one that finished 3-13 while dealing with a myriad of controversies, like former head coach Ben McAdoo benching Manning in favor of Geno Smith in Week 13. Under new head coach Pat Shurmur and general manager Dave Gettleman, they’re cleaning up the mess that McAdoo and former general manager Jerry Reese left behind. A piece of that future could be selecting Lauletta with the 108th-overall pick of the 2018 NFL Draft. McAdoo and Reese selected Davis Webb as Manning’s possible heir. Though when McAdoo made the ill-fated decision to bench Manning, they opted to start Smith — not Webb. Lauletta himself is still getting used to this. “It was a little weird at first — you’re in the Giants’ quarterback room with Eli Manning, and then you realize these guys are just like me, they’re humans that do all of the same stuff that I do,” said Lauletta, 23, who shredded the Richmond record book, passing for a school-record 10,465 career passing yards and 73 touchdowns, and a single-game record six touchdown passes in Richmond’s 68-21 win over Howard last season. “The other thing is that Eli is awesome, he’s just a normal guy who’s very down-to-earth. But at first, yeah, I was warming up and I was like, ‘Holy crap, I’m having a catch with Eli Manning right now.’ It definitely hit me. Lauletta will wear No. 17, since Webb, who the Giants took in the third round in 2017 wears No. 5, Lauletta’s number in high school and college. Lauletta took reps with the third team when the Giants were in OTAs in May, while Webb took reps with the twos. 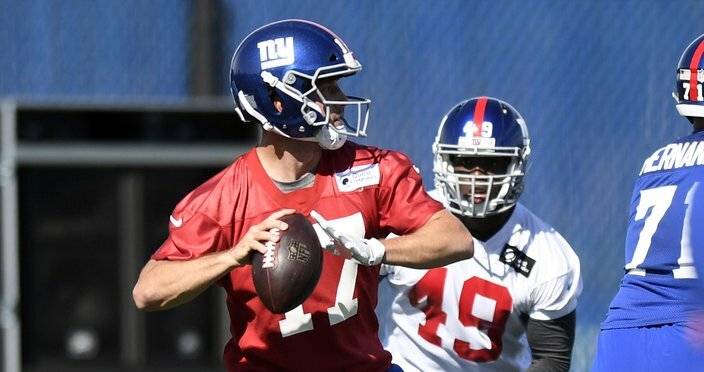 New York Giants quarterback Kyle Lauletta during rookie minicamp. Manning is going to be the starter — there is no doubt about that. Lauletta is excited about the opportunity to get a chance to play. What Lauletta has over Manning and Webb — in addition to being Shurmur and Gettleman's pick — he’s by far the fastest and most athletic of the trio. The Giants have a revamped offensive line. They also have arguably the best skill-position players in the NFC East, with a healthy Odell Beckham Jr., tight end Evan Engram — and future superstar running back Saquon Barkley. Getting rid of McAdoo was also a huge addition by subtraction. McAdoo began tinkering with Manning’s footwork. Throughout Manning’s whole career, he’s been a left-foot back quarterback in the shotgun — which is standard. McAdoo wanted Manning to go left-foot forward, which an increasing number of quarterbacks, like Tom Brady and Aaron Rodgers, do now. Over 14 years, Manning was very good with his left foot back. Of the four quarterbacks in Giants’ training camp, they use three different stances in the shotgun, which is okay by Shurmur. “You have to get to the back of your drop and it has to time up with the route concept. That’s the bottom line. 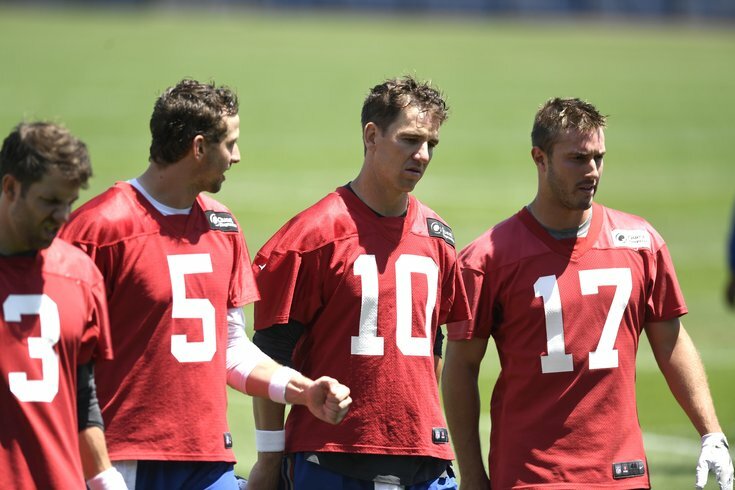 However you get there, this coaching staff doesn’t care, as long as you get there and do it consistently,” Lauletta said. “I really think we’re going to be pretty good. I’m looking to get a chance. It’s all I want — and it looks like with everyone around me, it looks like I’m going to get it. Brett Favre wasn’t exactly that forthcoming to Rodgers when he arrived, and more recently, Baltimore Ravens’ quarterback Joe Flacco didn’t throw down any welcome mats for Lamar Jackson when he was drafted. With Manning, Lauletta pointed out, he’s seen every NFL defensive concept. He’s given Lauletta advice to see through those schemes and see where openings are. “Eli is awesome with that, because he sees and knows these concepts, and the different options we could do off of that,” Lauletta said. “Davis Webb is a good guy. He’s been very helpful. We have a good quarterback room, and I can’t forget Alex Tanney, who’s been around the league and knows the game. He’s a good guy, too, just a great person. “Davis works hard. Davis is someone I follow. He was in my shoes last year. His football IQ is through the roof. He has a strong, strong arm and he’s been awesome with me. He is impressive, he’s 6-5, 230 and everything you want in a quarterback. We don’t have selfish guys. “It’s why this is going to work. I’m looking to get a chance. It’s all I want — and it looks like with everyone around me, it looks like I’m going to get it."